Usain Bolt is the greatest Catholic athlete in the world. Rio de Janeiro, August 2016. Usain Bolt’s name is announced for the 100-meter Olympic finals. He smiles, brushes off his shoulders and points at the camera. He could not appear more relaxed. On your marks. Bolt holds his finger to his mouth to quiet the crowd, or perhaps himself. He steps forward. He looks ahead. His smile is gone. He stretches his feet back onto the starting blocks and spreads his hands on the track. Head down, a Miraculous Medal hangs from his neck. Feet set on the blocks, he shifts onto his knees and looks toward the finish line. 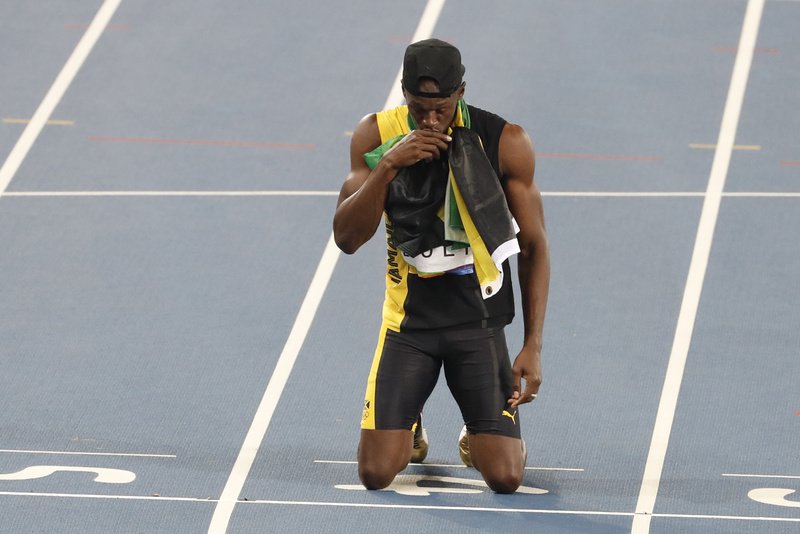 Then, in front of the 35 million viewers who tuned into this race, Bolt makes the sign of the cross, closing his eyes as he swipes his hand across his chest. He raises a finger to his lips and then toward the sky, as he looks upward. His eyes linger there for a healthy moment. Bolt makes the sign of the cross, closing his eyes as he swipes his hand across his chest. The starting gun fires, and the sprinters burst off the blocks. As usual, Bolt has a slow start, but at 50 meters he picks up and blazes down the track. The Miraculous Medal sways from his neck like a metronomic pulse. He burns through the finish line and eases into a jog in front of the crowd. He gets down on a knee, lowers his head and crosses himself again before standing. Usain Bolt is the greatest Catholic athlete in the world. He holds world records in the 100 and 200 meters. He has won eight Olympic gold medals. He has become a living legend in a track event that is known for creating superstars. His pre- and post-race rituals are purely Catholic, and yet the faith of one of the world’s most talked-about athletes is an open secret. Born and raised in Sherwood Content, Jamaica, Bolt grew up in a Seventh-day Adventist home. Although he attended an S.D.A. church during his youth, he did not become a member as an adult. As a Catholic, he has taken the middle name St. Leo. He has talked about praying the nights before his meets. He is open in interviews about his belief in God. The Vatican even invited Bolt to speak at the TEDx Via della Conciliazione conference on religious freedom in 2013. Bolt is a paradox. His confidence and swagger on and off the track seem at odds with his moments of ritual and contemplation. Yet the best way to understand Bolt’s identity is to recognize the innate traits of sprinters. Bolt’s high school coach called him “hyperactive.” He was known as a practical joker. Unlike distance runners, who settle into a regular and meditative pace, sprinters must channel a firecracker-like power. The 100 meters is theater, and Bolt is its finest performer. In athletic time, the 100 meters is a heartbeat. Bolt crosses the finish line in well under 10 seconds. Sprints are electric events, over barely after they have begun. The 100 meters is theater, and Bolt is its finest performer. In soccer and basketball, we dissect long matches and games for exclusive moments of brilliance: the perfect volley or defensive stop becomes fodder for endless highlight reels. The 100 meters, in contrast, is all or nothing. There is no down time, no pauses. Bolt’s pre-race metamorphosis is a tacit acknowledgment that he is about to enter another realm. The action of crossing himself, in some ways, is an invitation for the viewer to transcend the physical and enter that spiritual space where athletic greatness is possible. Bolt has spoken about his laziness, his dislike of training. Those admissions of humanity should be taken as small confessions of humility. For all his bravado, Bolt knows his athletic gifts must be cultivated. He is at once one of us and nothing at all like us. Bolt says he will retire after this year’s IAAF World Championships next month in London. He will try to win his fourth consecutive gold in the 100 meters there, as well as his fifth consecutive 4x100 gold. He says that he wants to retire as a champion, and who can blame him? Fans have watched his journey unfold and know that sprinters have short lives on the track. Along the way, one of the world’s most famous athletes has become an underground Catholic icon. Bolt encapsulates the intersection of sports and faith: the belief that we can achieve amazing things and transcend our everyday selves—or at least live through the transformation of others. It will be difficult to imagine the 2020 Olympic games in Tokyo without Bolt. Gone will be his showmanship, his incredible speed, his sense of performance, but most important, gone will be his witness. Here was an athlete at the top of his game—past, present and perhaps future—who slowed the whirlwind of competition to praise God. He held the sports world in his hands and with those hands, he pointed upward. What a gift, for him and for us. Indeed, but there was a young Catholic woman, gold medalist, who was a regular communicant. Will let the editors guess and not accuse them of misogyny. Go to any major league baseball game and watch the fellas from the DR cross themselves when they get up to bat. He may be the greatest pure athlete ever. Catholic IS as Catholic DOES. Saying one is a Catholic does not make it so. The Catholic Church and it's institutions, including this rag, the Jesuits, and "so called" Catholic colleges, are a mere shadow of what the Catholic Church was in the recent past, all the way up to a sham. I cannot help wondering if some sort of performance enhancing drug is involved in Bolt's shattering of records. I hope that is not the case, but the degree by which he broke the records is beyond startling. Athlete Usain Bolt - has set high standards. Praise the Lord. Nick Ripatrazone has written for Rolling Stone, The Atlantic, The Paris Review and Esquire. His newest book is Ember Days, a collection of stories.